When I heard that I could buy nun-baked cookies in Spain, I couldn’t wait to track them down. 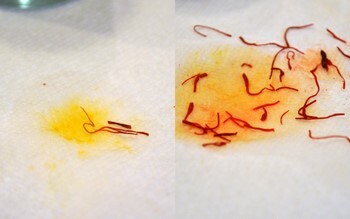 For me, it sounds like such a novel item and certainly something that I am unlikely to find in the states. The cookies are exactly what they sound like: cookies baked by nuns. Different nuns at different convents seem to specialize in different things, but cookies seem to be one of the highlights and are probably the easiest to find. I found mine in Seville at a shop called El Torno. 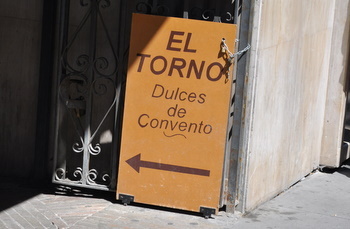 El Torno is located just across from the main entrance to the Cathedral in a small plaza off the main street. Although they’re baked by nuns, they’re not sold by nuns. 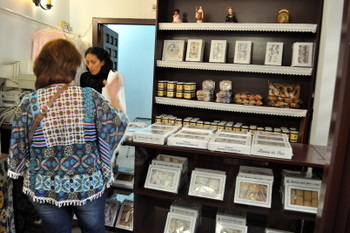 The woman running the shop pointed out the most popular cookies, all of which are made with traditional Spanish recipes. I settled on some orange almond cookies that looked particularly attractive. 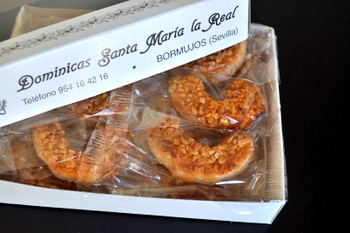 The cookies are all individually wrapped in attractive boxes with the name of the nuns who made them – Dominicas Santa Maria la Real – and I assume that they’re presented this way because it’s easier to sell them in boxes that happen to be the perfect size for gift giving. The cookies are chewy, almost like a macaroon, and have a great almond flavor to them, with a nice orangy sweetness to brighten it up. 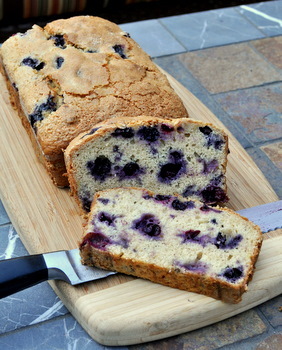 They’re not very sweet and the nuts on top add a great contrasting crunch to the whole thing. They’re not bad, and judging from how busy the shop was, I’d say that they are pretty popular. I won’t be trading in my chocolate chips, but I did buy a couple of boxes as gifts to bring home! What a neat cookie and company! 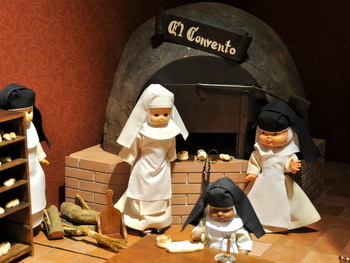 You don’t have to go to Spain, we have nun-baked cookies in Cleveland! You were at Plaza del Cabildo! Isn’t it the cutest plaza ever? It’s one of my favourite places in Seville! I belong to a community (sisters, not nuns) that bakes cookies, but not for sale – to give to our benefactors at Christmastime. This was a cute post! I love the little Dominican nun dolls.